Our blame culture means convenient scapegoats will be found for the latest social media debacle - take your pick from Facebook, Cambridge Analytica, Mark Zuckerberg, Alexander Nix, Aleksandr Kogan, Steve Barron and even Donald Trump. But when this appetite for scapegoats is satisfied, we will all return to posting our intimate personal data on Facebook; after, of course, tweaking a few privacy settings. What is puzzling about the Cambridge Analytica scandal is not that it happened, but how little interest there is in asking why 50 million people put their personal profiles at risk of being harvested. Some of the answers can be found by studying content farm WittyFeed. Many readers will not even have heard of WittyFeed, so here is some background. It is an online media and viral content company based in Indore, India - co-founder and chief operating officer Parveen Singhal is seen in the graphic above. 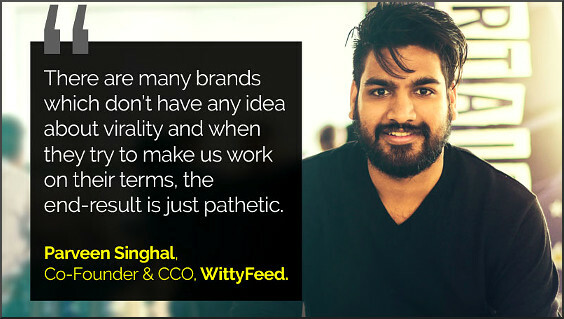 With an annual revenue of ₹50 crore ($705 million) WittyFeed is the world’s second largest viral content company after BuzzFeed as measured by traffic numbers. It is one of the top 200 websites in the world with 120 million unique visitors and more than 420 million monthly page views. Viral content spreads rapidly online through social sharing and website links, and WittyFeed's most celebrated success story 'What happens to your poop in an airplane toilet will leave you surprised' reached half a million page views within days of going viral. In India - a country with 1.3 billion people - WittyFeed's site traffic is greater than that of Twitter and Instagram. But that success is not limited to the sub-continent: America is WittyFeed's biggest market and contributes 40% of total site traffic. WittyFeed's maxim of 'It's emotion that goes viral' is key to understanding why Cambridge Analytica was able to harvest personal and intimate information about 50 million people. Facebook alone has 2.2 billion monthly active users and the goal of every user of Facebook, Twitter and all the other social media platforms is virality. We want our stories to go viral. We crave approval in the form of likes, sharing and re-tweeting by lots and lots of people. And as the WittyFeed success story resoundingly proves, it's emotion that goes viral. So Facebook encourages us, no compels us, to share emotions by breaking down all the barriers between our private and public lives. Or as Wired founding editor Kevin Kelly explained rather more succinctly, on the internet vanity trumps privacy. This thread has much relevance to an Overgrown Path's core interest of art music. Norman Lebrecht's Slipped Disc blog is a music content farm modelled on Buzzfeed and WittyFeed, and it obeys the post-truth rule that it is emotion and not facts that goes viral. Which explains why Slipped Disc is the most widely read art music blog globally: whatever else Norman gets wrong he does understand virality. In her book Snigdha Poonam writes about twenty-six year old DJ R.J. Shanky whose popular show Josh Factory is broadcast in Ranchi, India. She explains that, like the click baiters of WittyFeed, Shanky doesn't offer his audience of nearly a million listeners music and news, but the emotions with which to react: pride, relief, shame outrage etc. BBC Radio 3 has adopted this fashionable tactic of moderating emotions - 'that heart felt performance of Mahler's stirring First Symphony was passionately played by...' - but unfortunately without the success in winning audiences achieved by WittyFeed and R.J. Shanky. The future of the post-truth and post-Cambridge Analytica world looks disturbing. As explained above, the second largest dedicated content farm in the world derives 90 per cent of its traffic from Facebook. My own very modest Overgrown Path blog declines to play the emotions game, yet in the past month 65.9% of its site traffic came via Facebook. So I may not play the emotions game; but if I do not play the Facebook game my readership dips below the point of viability. At a macro level Facebook virtually controls classical music through its news feed algorithms - an insidious technology that has disappeared from critical view due to the current preoccupation with profile harvesting. Facebook and Mark Zuckerberg will suffer some minor damage from the Cambridge Analytica controversy. But all of us - yes, this post will be linked on social media - have created a monster that will simply shrug off the current attacks. My fear is that the Facebook monster will eventually eat us all. It all feels choreographed somehow. These live recordings are released here for the very first time. He has never recorded Brahms’s Handel Variations in the studio, which makes this his first commercially available recording of the work.